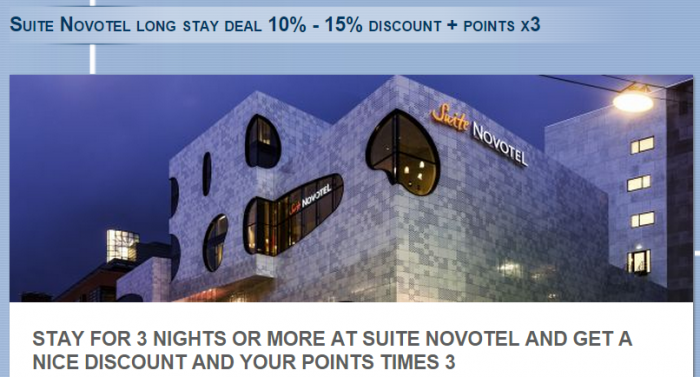 Le Club Accorhotels has launched a triple points and 10% to 15% discount offer for stays at select Suite Novotel hotels. The offer is valid for stays that are consumed between February 6 and April 8, 2015, and booked February 6 – March 8. Note that the minimum stay is 3 nights and maximum 7 under this offer. You can earn the triple points only once during the offer period. Triple points for a Suite Novotel stay is a nice bonus if you are planning to stay at any of the participating properties during the offer period. 2. This offer is valid for any ’Suite Novotel’ stay with minimum 3 nights done between 06/02/2015 and 08/04/2015 in one of the participating hotels, and booked between 06/02/2015 and 08/03/2015. Stay at least 3 consecutive nights and with a maximum of 7 consecutive nights. 3. This offer entitles Le Club Accorhotels Loyalty program members, regardless of their status, to benefit from earning X3 bonus points in one of the participating Suite Novotelhotels in Europe. The number of bonus points for this offer is calculated according to the points earned by the member based on “Classic” status. 10. This offer can be used only once per member during its validity period.